Hurray!!! 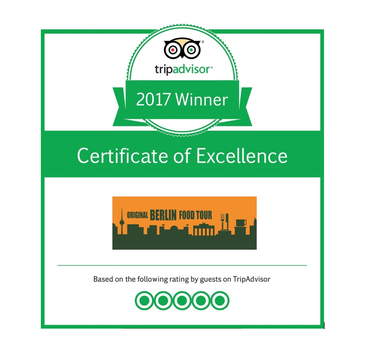 We just have been informed that Berlin Food Tour is "Winner of the Certificate of Excellence 2017": The "Certificate of Excellence Recipients Represent Top 10 Percent of Businesses". We want to thank you all for your support of Berlin Food Tour, the productive feedbacks, the wonderful tours, the great people & talks, new friends around the world. Thanks for being so AWESOME!!!! Cheers from Berlin!